US, 1990, 121 minutes, Colour. Robert de Niro, Robin Williams, Julie Kavner, John Heard, Ruth Nelson, Penelope Ann Miller, Max Von Sydow. The film concerns a number of patients affected by encephalitic disease in the 1920s, a sleeping sickness which put them into coma. In the 1960s Sacks, experimenting with the drug El Dopa, enabled a number of the patients to come alive again, to awaken. While the awakenings were short lived, for a brief time in 1969 the group had some life. 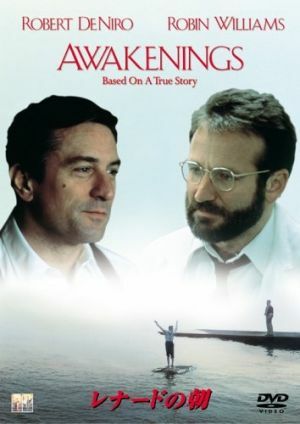 Sacks, called Malcolm Sayers in the film, is played by Robin Williams at his subdued best. In many ways it is a self-effacing performance, even more subdued than his performance in Dead Poets Society. Robert de Niro co-stars as one of the patients, giving a tour de force performance as a patient in coma, and especially as the drug loses its effect and he loses control. (It is a star turn, inviting comparison with Dustin Hoffman's Rain man.) The strong supporting cast is led by Julie Kavner as a nurse and Ruth Nelson as de Niro's mother. A number of veteran stage and screen actors and actresses portray the coma victims. They include Alice Drummond, Anne Meara, Richard Libertine and jazz artist Dexter Gordon. The film was directed by actress-director Penny Marshall, whose previous films were Jumping Jack Flash and Big. 1. The film based on a true story, Dr Sacks, his experience in the Bronx, 1969 and El Dopa, the experience of the patients, the aftermath of the experiments? 2. The blend of the serious and the comic? Exploration of human nature, despair, hope? 3. The Bronx in 1969, the hospital, re-creation of the period? Musical score? 4. The title, its reference to the patients, their coming alive, going back into coma, temporary awakenings? Rich experiences of awakening? 5. Robin Williams's style as Dr Sayers, his appearance, small, the beard, awkward and nervous, the interview, his explanations of his research, the five years with the worms, his lack of experience with human patients? Getting the job? Eleanor and her interest, support - but his not having coffee with her? Going home alone, reading, his love for research? Gradually getting to know people? The encounter with the black woman and her fear of pens? The shouting man? The coma patients? Lucy, open-mouthed and gazing, her catching the glasses, her wanting to walk across the room? The various reactions of the patients? His puzzle, the discovery about the reflexes, getting all the patients catching things? His theory about Parkinson’s Disease being arrested? The possibility of drugs? Persuading the doctor to give permission? His arguments? The contact with Leonard, Leonard's brain-scan and responding to his name, the letters of Rilke and the panther? His visit to the zoo, reading Rilke's poem and the desperation of the panther looking out of the cage? Appropriate image for the patients? His response, going to Leonard's mother, explanations of the administering of drugs, his hopes? The vigil? The awakening? The experiences with Leonard, talking, sharing, the past, Leonard's meeting with his mother? Explanations, reactions? Filming him? The possibility of the others awakening? The staff donations? The film for the committee and their response? The medical observations, the awakenings, the patients and their true selves, Lucy and her going to look out the window? His response, organising them to go to the zoo, their boredom and their going to dance, his being forced to dance, awkwardly? Leonard beginning to fail, his mother's desperation, Dr Sayer giving his support, experiments with medication, the disappointment, easing Leonard back into his sleep, the memories of sharing, the sadness, his watching the films of Leonard awake, the reality of Leonard back in coma again? Eleanor's support? Having the cup of coffee with her? Dr Sayer's own awakening? 6. Leonard as a boy, writing his name, failing with his name, at school, his stories, at home, his mother keeping him inside, the boys coming to visit him? Hospital, going into coma? His behaviour in coma as an adult? Robert de Niro's performance as Leonard, in coma, awake, declining? The brain-scan and his response, the image of the panther in Rilke's poem? The medication, awake, writing his name, introducing himself. 30 years past, his age and the mirror, shaving? Talk, joy, sharing? The attraction to Paula, not going to the zoo, the meal with her and his explanations? His achievement? Sharing with Dr Sayer? The beginning of the decline and collapse, his mother's refusal to face it? With Paula and his awkward gesticulations during the meal, dancing with her, watching her leave? His collapse, the sadness of his going into coma? 7. His mother, her 30 years' care of her son, her control over him, not realising how grown up, questioning God about his illness? Giving permission, the joy of Leonard awake? Her not wanting to face that he could decline again? 8. Eleanor, her support, seeing Dr Sayer as a kind man, sharing the exhilaration, the final cup of coffee? 9. Dr Kaufman, touch, administration, the interviews, bargaining for Leonard and the drugs? The appeal for the others to go on medication? The presentation of hospital administration? Doctors, nurses watching television, the orderlies, their response to the patients coming alive? 10. Lucy, in coma for 40 years, her reflexes, walking across the room, painting in the squares, coming alive, looking out the window? The eccentric man and his friend, coming alive, wanting to marry? The woman with grey hair, dyeing it, her vivacity in dancing? The other men and women and their place in the wards? Alive? The musician? The gaps in their life, coming awake, seeming a dream? The outing, the zoo, the dancing, their collapse? 11. Paula, visiting her father, his stroke, reading to him, hoping he was responding in some way, the encounter with Leonard, the meal, talking, his reassuring her that he father understood, the final meal and Leonard collapsing, the dance, her looking back? 12. The issue of drugs, tests, opportunities? The capacity for awakening the patients - but only temporarily? Better to administer the drugs or not? 13. The film and its serious side, comedy, exploration of the value of life?